Kunayev, the son of a Kazakh clerk, grew up in a middle-income family. He graduated from the Institute of Non-Ferrous and Fine Metallurgy in Moscow in 1936, which enabled him to become a machine operator. By 1939 he had become engineer-in-chief of the Pribalkhashatroi mine, and joined the Communist Party of the Soviet Union (CPSU), a condition of the position. Kunayev was deputy chairman of the Council of Ministers of the Kazakh SSR from 1942 to 1952. In 1947, 1951, 1955 and 1959 he also was a deputy in the Kazakh SSR Supreme Soviet. Kunayev's rise in Communist Party ranks had been closely tied to that of Leonid Brezhnev's. Khrushchev appointed Panteleymon Ponomarenko as the first secretary of the Communist Party of Kazakhstan, and Leonid Brezhnev as the second secretary, in February 1954. Soon, Kunayev and Brezhnev developed a close friendship which lasted until the death of Brezhnev. Brezhnev became the first secretary of the Communist Party of Kazakhstan in 1955 and a member of CPSU Politburo in 1956. When Brezhnev left Kazakhstan in 1956, I. Iakovlev became the First Secretary of the Kazakh Communist Party. Kunayev had to wait until 1960 to attain the post. Kunyaev was an ardent supporter of the Virgin Lands campaign which opened millions of hectares of lands in Central Kazakhstan into agricultural development and caused a large influx of Russian immigrants into Kazakhstan. In 1962 he was dismissed from his position as he disagreed with Khrushchev's plans to incorporate some lands in Southern Kazakhstan to Uzbekistan. 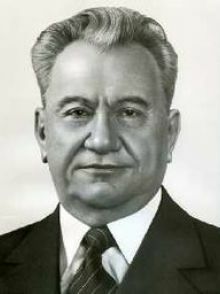 Ismail Yusupov, a supporter of the plan replaced Kunayev. He became first secretary of the Central Committee of the Communist Party of the Kazakhstan again in 1964 when Khrushchev was ousted and replaced by Brezhnev. He kept his position for twenty-two more years. He was an alternate member of the Politburo from 1967, and a full member from 1971 to 1987. During Kunaev's long reign, Kazakhs occupied prominent positions in the bureaucracy, economy and educational institutions. A Brezhnev loyalist, he was removed from office under pressure from Mikhail Gorbachev, who accused him of corruption. On December 16, 1986 Soviet Politburo replaced him with Gennady Kolbin, who had never lived in the Kazakh SSR before. This provoked street riots in Almaty, which were the first signs of ethnic strife during Gorbachev's tenure.In modern Kazakhstan, this revolt is called Jeltoqsan, meaning December in Kazakh. Kunayev was awarded the Gold Star of Hero of Socialist Labour three times.He spent the last years of his life in charitable activity, establishing the 'Dinmukhamed Kunayev Foundation', one of whose purposes was the support of political reform in Kazakhstan. An institute and avenue in Almaty have been named after him as well as an avenue in downtown Astana. Information was taken from the site wikipedia.